Please select a size. 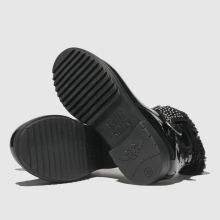 UK 8 - Low StockUK 9 - Low StockUK 10 - Low StockUK 11.5 - In StockUK 1 - Low StockUK 2 - Low StockUK 2.5 - In Stock Please select a size. Chic style isn't hard for your little fashionista to achieve with this new season Lelli Kelly kids' boot. Crafted with a patent leather upper, the all-black Renee boasts a glam diamante overlay with a sweet heart buckle while a faux-fur trim completes.